Lt. George L. Fox’s tenure as pastor of the Downs Methodist Episcopal Church was rather uneventful but his legacy as an Army chaplain just 14 years later lives on. Fox was one of four chaplains that perished on the U.S.A.T. Dorchester when it was hit by a torpedo from a German U-boat off the coast of Newfoundland Feb. 3, 1943. Fox, who graduated with a A.B. degree from Illinois Wesleyan University in 1931 was pastor at Downs from 1929 to 1931. He had served as a veteran of World War I, having lied about his age in order to enlist with the ambulance corps in 1917. On Dec. 3, 1917, Fox embarked from Camp Merritt, N.J. and board the U.S. Huron en route to France, where as a medical corps assistant, he was highly decorated for bravery and was awarded the Silver Star, Purple Heat and the French Croix de Guerre. A native of Pennsylvania, Fox returned home after his discharge and when to work for the Guarantee Trust Co. In 1923, Fox entered Moody Institute in Chicago and later withdrew to become an itinerant Methodist preacher. Following graduation from Illinois Wesleyan University and his pastorate at Downs, he entered Boston School of Theology and was ordained in 1934. He served several pastorates in Vermont and joined the American Legion where he was appointed state chaplain and historian. 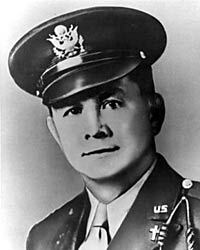 In mid-1942, Fox joined the Army Chaplain Service and went on active duty Aug. 8, 1942, the same day his son Wyatt enlisted in the Marine Corps. He was assigned to the Chaplains school at Harvard, where he became friends with Jewish Rabbi Lt. Alexander D. Goode, Roman Catholic priest Lt. John P. Washington and Lt. Clark V. Poling of the Dutch Reformed Church. 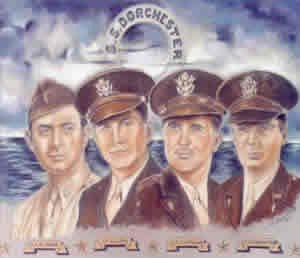 After a brief deployment to the 411th Coast Artillery Batallion at Camp Davis, Fox reunited with the other three at Camp Myles Standish in Tauton, Mass., where the four made their fateful trip aboard the Dorchester. Once a luxury coastal liner, the 5,649-ton vessel had been converted into an Army transport ship, carrying 902 service men, merchant seaman and civilian workers. The Dorchester, one of three ships in the SG-19 convoy, was moving steadily across the icy waters from Newfoundland toward an American base in Greenland. SG-19 was escorted by Coast Guard Cutters Tampa, Escanaba and Comanche. Sonar had detected submarines in the area. Just 150 miles from their destination, Captain Hans J. Danielsen ordered the men to sleep in their clothing and keep life jackets on. Many soldiers sleeping deep in the ship's hold disregarded the order because of the engine's heat. Others ignored it because the life jackets were uncomfortable. At 12:55 a.m. Feb. 3, the German submarine U-223 approached the convoy on the surface, and after identifying and targeting the ship, gave orders to fire the torpedoes, a fan of three were fired. The one that hit was decisive--and deadly--striking the starboard side, amid ship, far below the water line. Through the pandemonium, according to those present, the four Army chaplains brought hope in despair and light in darkness. Quickly and quietly, the four chaplains spread out among the soldiers. There they tried to calm the frightened, tend the wounded and guide the disoriented toward safety. The Distinguished Service Cross and Purple Heart were awarded posthumously Dec. 19, 1944, to the next of kin by Lt. Gen. Brehon B. Somervell, Commanding General of the Army Service Forces, in a ceremony at the post chapel at Fort Myer, Va.
A one-time only posthumous Special Medal for Heroism was authorized by Congress and awarded by the President Eisenhower Jan. 18, 1961. Congress attempted to confer the Medal of Honor but was blocked by the stringent requirements that required heroism performed under fire. The special medal was intended to have the same weight and importance as the Medal of Honor.